For getting around Avon, Indianapolis, and Plainfield, you need a reliable car. The 2018 Toyota Corolla and Hyundai Elantra are two of the most popular and dependable compact cars on the road today. Andy Mohr Toyota put these two sedans up against each other to create this comparison of the Toyota Corolla vs. Hyundai Elantra to highlight what each one can offer you. The 2018 Toyota Corolla has a roomier interior than the 2018 Hyundai Elantra. For starters, passengers can sit more comfortably in the back seats of the Corolla. It lets your friends or family stretch their legs with 41.4 inches of rear legroom. The Elantra is almost six inches smaller in the back, with only 35.7 inches of legroom. Plus, there’s nearly two feet more space inside the Corolla. Its total interior volume is 97.5 cubic feet, while the Elantra only has 95.8 cubic feet of space. Both the 2018 Corolla and 2018 Elantra feature an integrated touchscreen on the dashboard. However, the Corolla gives you more control and greater awareness. 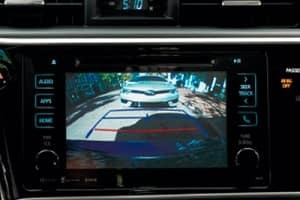 A backup camera comes standard on the Corolla to help you be aware of your full surroundings. The Elantra only makes a backup camera available on some of its trims. Next to the touchscreen, you’ll find more information laid out in a design that complements the sporty feel of the Corolla. The speedometer and tachometer are illuminated to give the sport gauge a sleek look. Between the two gauges, you’ll find a screen displaying real-time specs on your car’s performance. In front of the sport gauge, you’ll find available paddle shifters on the steering wheel to give you more control and the freedom to shift quickly whenever you want. 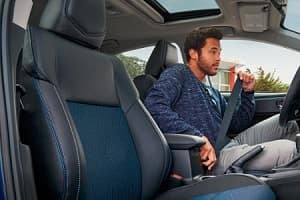 The 2018 Elantra also features a well-designed interior cabin but it doesn’t have the sporty look and feel of the Corolla. Pre-Collision System with Pedestrian Detection sends you alerts and applies the brakes if you’re approaching a person or stopped vehicle. Lane Departure Alert with Steering Assist lets you know if you’ve begun to drift out of your lane and can guide you back to the right path. Automatic High Beams detects incoming headlights and taillights, then automatically switches between high and low beams. Dynamic Radar Cruise Control helps maintain a safe following distance on the highway by adjusting your speed when the car in front slows down. Together, these features have earned the 2018 Corolla a 5-Star Overall Rating from the National Highway Traffic Safety Administration (NHTSA). The 2018 Elantra has some similar safety features but it only earned a 4-Star Overall Rating from the NHTSA. After looking at the interior, infotainment features, and safety, it’s clear that the 2018 Toyota Corolla delivers the full compact car experience. This Toyota Corolla vs. Hyundai Elantra comparison has given you an idea of what the Corolla has to offer. However, to really experience what it’s like to drive around Avon, Indianapolis, and Plainfield in the Toyota Corolla, stop by Andy Mohr Toyota to get behind the wheel and take a test drive.